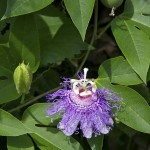 What do I do with passion flower seed pods during summer season? I have a potted passion flower on my sunny rear deck that is doing beautifully and has had many blooms, which are now developing into green pods. What do I do with the green pods as I want to encourage more blooms throughout the summer months? If you do not plan on propagating any additional plants, you can simply cut them off and dispose of them. Otherwise, you can remove the seeds and germinate them for planting.